Whether you like it or not, you can not escape that today is Valentines day. Everywhere is covered in a candy coloured, rose scented gleam with an excessive amount of hearts decorating everything. I'm not really one for hearts and roses; I'd like yo think I make an easy girl friend on this day, however one of my best friends is more the traditional girlfriend. In a bit of a panic she asked for my advice on what she could do on Valentines day for her boyfriend. I really do hate the whole commercial side of valentines day, so I suggested she make instead of buying, a box of chocolates, and having them delivered to his house, with the name of the restaurant she'd secretly booked for later tonight written inside. See I can be romantic after all. First get 2 pans, one smaller than the other. Fill the smallest about half way with water, and bring to the boil. Break up 150g of Dark Chocolate and add to the larger pan. Place the larger pan over the smaller one, and continuously sir the chocolate until it melts. Once melted, immediately pour into the moulds. Don't worry if it over flows- use the back of a knife to scrape the chocolates flat. Place in the fridge for 30 minutes or until set. Repeat after with the White Chocolate. Place the chocolate dome side up with the point facing one of the corners of the silver side of the gold wrapper. Fold in the corners, and then smooth the wrapper around the chocolate. Fill your box with tissue and brown paper as desired, and then pile in your chocolates. Any left over? There shouldn't be- they should be your belly by now! She's due to give them tonight, so fingers crossed! Even if you are single this year, don't panic- just think, more chocolate for you! I still need to buy this magazine! I saw it on TV and secretly hoped my boyfriend got my hints (he didn't). Wow! What a thoughtful present! Laura, you're clearly a girl of many talents. I just popped into M & S and all the chocolates looked rubbish! I'm definitely doing this next year! Aw they're so cute!! Nothing better than when something's handmade :) Happy Valentines!! This is such a great idea - i'm a sucker for anything heart shaped! omg this is the cutest idea for any gift or party. even though its past valentines day this is soooo cute! 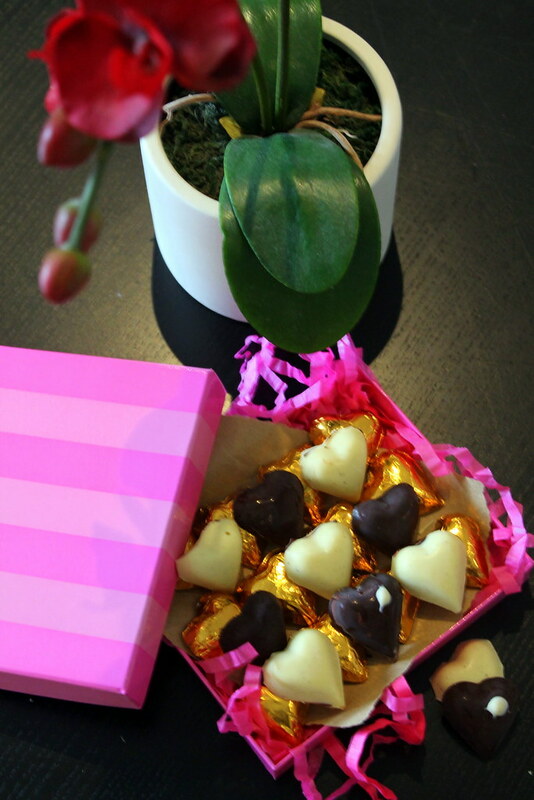 Thanks for the information about homemade box of chocolates they are great gift! Now you can buy chocolates for any event. wow really a great and fantastic self heart made chocolate thanks for sharing. That's a nice and awesome recipe homemade you have shared. thanks for sharing this. I appreciate it very much.